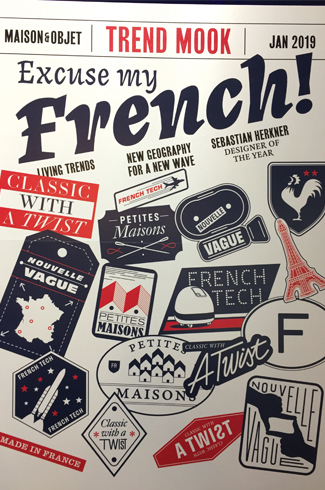 Highlights of the fair included this year’s theme Excuse my French! 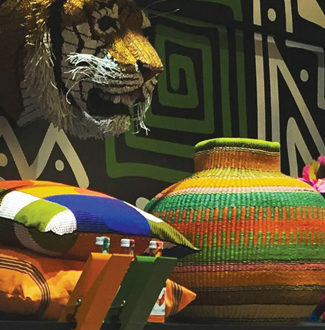 Besides showcasing a smorgasbord of products for its interior design customers, MAISON&OBJET also connects the industry professional to retailers from all around the globe. The MAISON&OBJET exhibition welcomed 84,236 visitors, including 46,356 French and 37,880 international visitors from 160 countries. 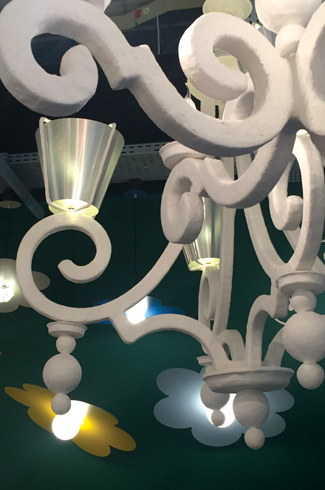 2910 brands presented their latest creations Dividing the fair into two hubs, Maison and Objet, also made it easier to understand and more intuitive for visitors this year. 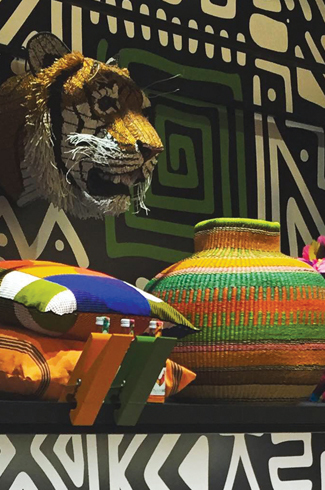 MAISON&OBJET confirmed it’s continuing appeal, its ability to bring together a global community of decoration, design and lifestyle professionals with a business impact. Twice a year, the fair offers market players an insight into trends in the sector and helps boost their growth. 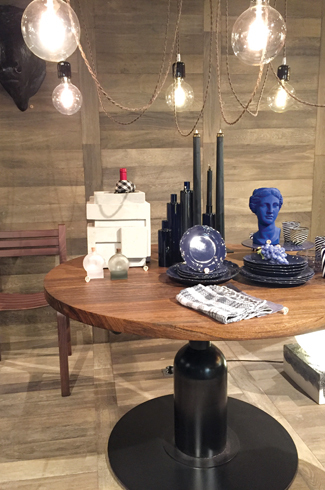 Launched in 2016, its digital platform MOM (MAISON&OBJET and MORE), is functional all year long and continues to inspire and connect industry professionals through its regular weekly newsletters. The MAISON& OBJET social networks have also broken new records by crossing the threshold of 600,000 followers on Instagram and 500,000 followers on Facebook. Highlights of the fair included this year’s theme Excuse my French! 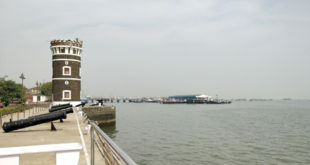 That emphasized French-made brands and a whole new generation of creators. 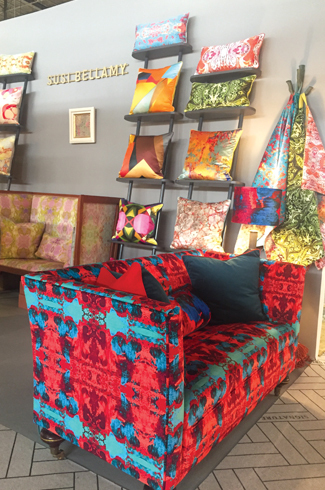 Colourful textiles were up front and centre with multi coloured cushions, fabric animals and woven rugs and urns. 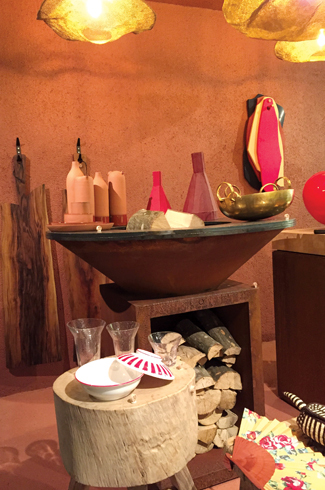 Flamboyant crockery and ultra cool merchandise for the home were on display, showcasing the contemporary new generation of French creation. The Rising Talent Awards organised in collaboration with DesignChain, put China in the spotlight, giving six emerging designers the opportunity to work on new joint ventures and foreign exposure, particularly since the exhibition has now moved to the atrium of Galeries Lafayette Homme department store from 25th January to 19th February 2019! Standout pieces included the almost puzzle like polychromatic sofa by Frank Chou Design Studios and the beautiful brass and marble pieces by Urbancraft from Shanghai that creates fusion pieces inspired by its Chinese heritage. German designer, Sebastian Herkner who was voted Designer of the Year, presented, in a dedicated space, his main achievements and his signature, multiculturally inspired style that gave importance to colour and married craftsmanship and innovation. The What’s new? space showcased more than 500 brands and nearly 1,500 new products from all over the world hand-picked at the fair by top trend-setters Elizabeth Leriche, François Bernard and François Delclaux. 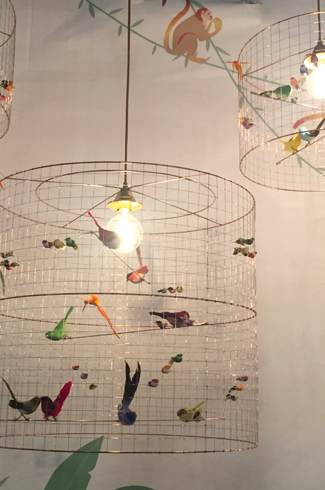 Lighting trends included the more simplistic rattan shades, bird cages, parrots and bunny pendants to the more surreal cat lights and bending lamp-posts at Seletti. 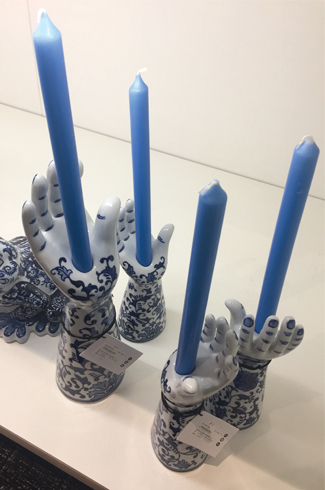 Another always interesting brand was Pols Potten with its new collection of blue and white ceramics obviously inspired by the Dutch Delft Blue. 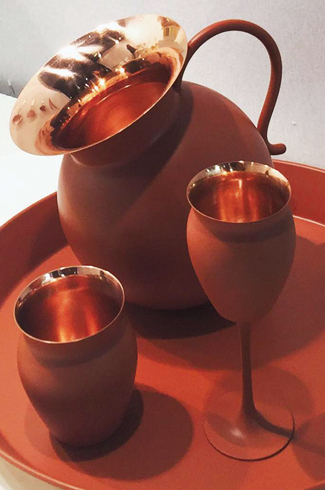 India was proudly represented at the show with new brands such as Ekkis that took Indian objects that are part of everyday culture and elevated them into novel pieces, like the Chai glass champagne flute and the matka wine glasses. Others that caught our eye was Jaipur Rugs that had an Indian weaver causing the maximum stir amongst gawking fair goers. 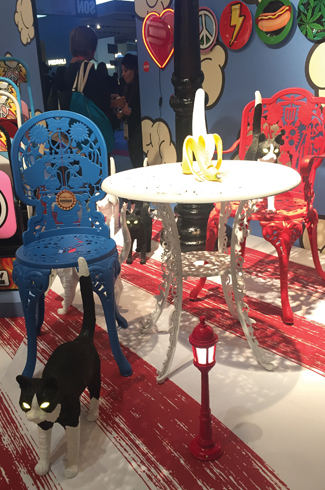 Philippe Brocart, General Manager of MAISON&OBJET explains that at each fair they choose themes that have reflected underlying societal trends and which are insightful and serve to bring everyone together. 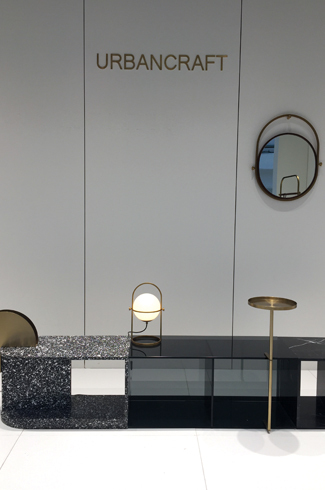 “As MAISON&OBJET also showcases objects and accessories in addition to layout and furniture, one must visit our What’s New spaces as they present a selection of new products. We also organise a series of talks and workshops to shed light on our chosen theme for the season, including business meetings focused on the market which allows users to meet manufacturers and designers at each edition,” says Mr. Brocart. The next MAISON&OBJET fair, from 6th to 10th September will explore a theme that’s making the news: the workspace. Our evolving relationship with work, driven by social change is reinventing the office. Manufacturers, distributors, space planners and fitters are turning to home design to add personality, friendliness, comfort and creativity to workspaces. 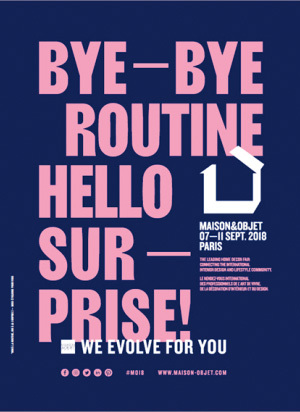 MAISON&OBJET aims at helping players in the office design sector take a fresh approach to the workspace based on a selection of furniture and decorative objects and the forward-looking expertise of our partners. The next fair will welcome them to Paris, at the heart of Europe’s leading economic region with 52 million sq.m of office space and the champion of the reinvented workspace with nearly 7,000 start-ups, 135 incubators and 210 co-working spaces. MAISON&OBJET will be a laboratory for expressing a new art of work.